I was the first in line because I was hungry, but also because I wanted to learn what the best food was. The guy running the truck that day highly recommended the brisket in sandwich form, so despite my previous painful brisket experience I took him up on it and ordered it regular sized because I’m trying not to be the fattest person in the world. Quality over quantity, right? Oh, I should also mention that it came with cole slaw and a side. I chose the mac and cheese and let them no there was no need for slaw because I’m not a stupid rabbit. It arrived on a bun doused in BBQ sauce. Doused, I say. But honestly, I didn’t really mind it. Sure, I would have taken about half the sauce, but somehow the brisket itself was still able to shine through, all chopped up and full of smokey goodness. A couple of the bits were kind of tough, but that’s a minor complaint in the grand scheme of brisket. The mac and cheese was actually pretty fantastic, with a great noodle to cheese ratio and relative moistness that I found comforting. 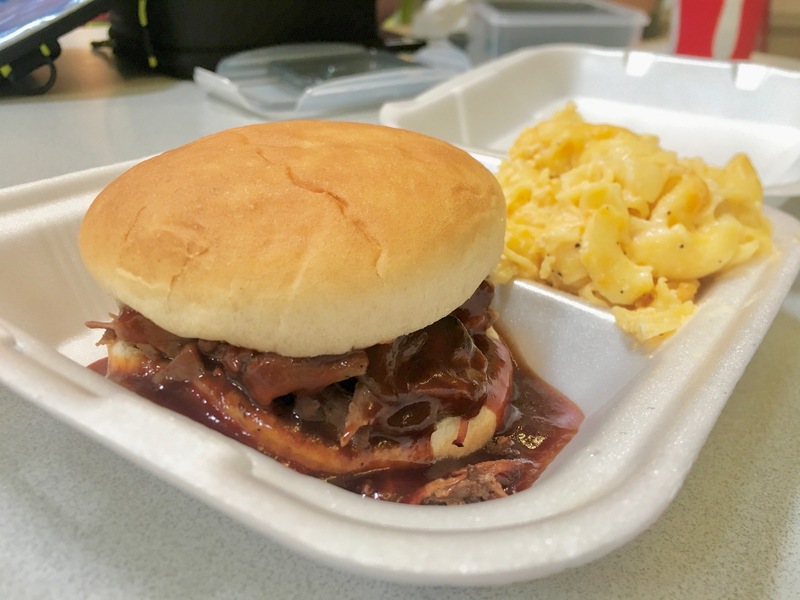 Sweet Magnolia Smokehouse may not be the best brisket in the land, but it definitely serves up some solid BBQ – albeit with some questionable sauce volume.